Chris from Expressive E shows us the Expressive É Arché Bowed Instrument Emulation and Touché Controller at Winter NAMM 2019. BITWIG’S Dave Linnenbank shows us the new Modular GRID at Winter NAMM 2019. Modularity has been at the core of Bitwig Studio from the beginning. Devices can be nested, clips are containers, modulators exist everywhere, and practically anything can be dragged anywhere. But with Bitwig Studio 3, they are zooming out so you can push in. The Grid is an open modular environment that powers a family of new devices in Bitwig Studio 3: Mono Grid, Poly Grid and FX Grid. With a vast library of modules and a supersonic workflow, you’ll be creating your own unique sounds immediately, and in high-fidelity. Simply add a Grid device to your project and start patching. It’s fun. Construct a polyphonic synthesizer from scratch in one session. Create an adaptive audio effect with your signature sound. Experiment with generative drones until you find a new way to perform. Or simply create the undefinable. Patching is effortless, giving full rein to your creativity. We check out the Ampeg SVT 5oth Anniversary amp at Winter NAMM 2019. During the 2019 Winter NAMM Show, Ampeg introduced the special edition Heritage™ SVT® 50th anniversary model to commemorate the 50th year of the SVT setting the standard for professional bass amplification. The original Ampeg SVT (“Super Vacuum Tube”) 300-watt amplifier head had its professional debut on the Rolling Stones’ iconic 1969 U.S. tour, with eight SVT heads across the stage to power all of the guitar and bass instruments. The SVT 50th anniversary model’s first channel features the authentic sound of the original 1969 model that launched the series. Channel two is voiced from a hand-selected mid ‘70s SVT model that represented the ideal of the “golden-era” evolution of SVT. Both channels are still complimented with the massive SVT 300-watt tube power section, which is unrivaled to this day. While delivering authentic vintage sounds, each unit is hand assembled in the USA and utilizes modern quality components and production techniques to ensure dependable operation gig after gig. For this special anniversary edition, careful attention has also been paid to cosmetic details such as a laser-etched panel and top-quality cabinet hardware. The combination of “best of the best” channel selection, classic SVT tone and power, modern USA assembly, and attention-to-detail cosmetics makes the Ampeg 50th Anniversary heritage SVT a bass amp worthy of any stage. 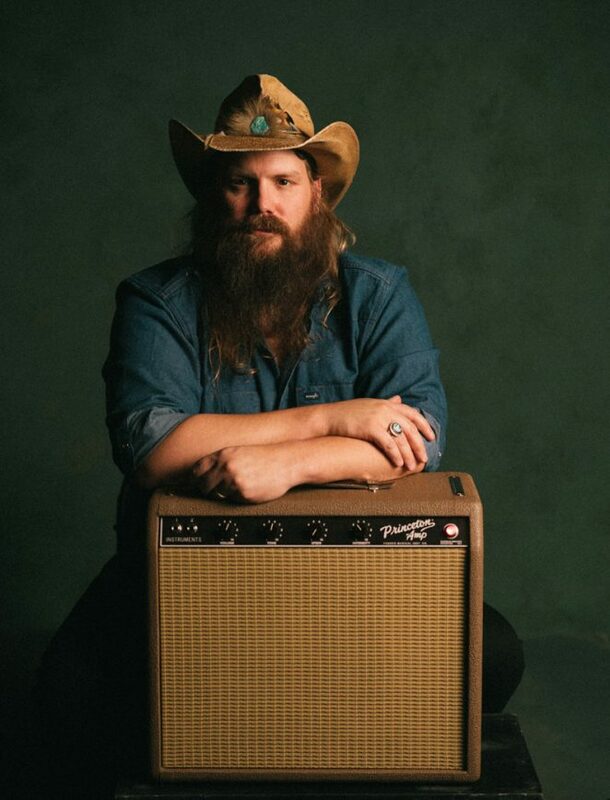 Fender unveiled its first signature artist amp collaboration with Grammy award winning musician Chris Stapleton: the all-new Fender ‘62 Princeton Chris Stapleton Edition amplifier. This is the first artist signature amp ever released by Fender for a country artist. Stapleton remains one of Country music’s favorite artists receiving multiple nominations and awards from the Grammys, CMA Awards, Billboard Music Awards and more. The natural collaboration came together from Stapleton’s love for Fender amps and the ‘62 Princeton amp in particular. Fender set out to recreate and revamp Stapleton’s favourite amplifier not just cosmetically, but also internally and sonically, all kept to the specs of his original find. Chris’s take on the iconic Fender Princeton amp features a retro aesthetic with rough textured brown vinyl covering and an engraved brass plate with Chris Stapleton’s signature. You can check out Chris Stapleton explaining the story behind the collaboration and his love for the ‘‘62 Princeton amp in the video below. The amp also features a retro-styled Filson™ Rugged Twill fabric cover. Rugged Twill is preferred for its durability and dependability in the field. As part of the collaboration, Stapleton personally requested all artist royalties be donated to his charity, “Outlaw State of Kind.” OSOK is Chris and Morgane Stapleton’s charitable fund that supports a variety of causes that are close to their heart. The Outlaw State of Kind Fund was founded in 2016 and is administered by the Community Foundation of Middle Tennessee. Michael Lewis from Line 6 shows us the new Relay G10s wireless system. The Line 6 Relay G10s wireless system features 24-bit quality, 130′ line of sight range and a solid metal construction pedal format. It is simple to use, similar to their G10 model and still offers the high-quality features required by gigging musicians. It includes large ‘stage friendly’ RF and battery status indicators, so you know what is going on when using it. The unit has both a 1/4″ main output t pedalboard/amp and an XLR output, which means you can send your signal to FOH or a PA system. Ryan from Guild Guitars shows us what’s new at Winter NAMM 2019. Fender Musical Instruments Corporation (FMIC) recently debuted its 2019 electric guitar and bass offerings at Winter NAMM in Anaheim, Calif. The robust lineup is a true reflection of Fender’s dedication to electric innovation; it includes: American Performer, a series catering to performers’ on-stage demands; the Rarities Series – featuring limited-edition, upscale, boutique-style models with high-end finishes and unique woods; and the Alternate Reality Series – a celebration of iconic Fender models of the past with futuristic trends in mind. In addition, the highly-acclaimed American Elite and American Professional Series have expanded to include new finishes. Recently launched, the American Performer Series celebrates both the boom in live musical performances and the demand for a roadworthy instrument that can handle any artist’s demands, no matter the arena. Featuring 36 SKUs, the American Performer Series brings the Jazzmaster®, Mustang® and Mustang Bass into the US-made line in the A$2,149 – $2,249 price range. The Performer Series blends traditional Fender design with new elements for modern tone and performance. Together, the updates deliver sonic versatility and ease of use for performers, helping them hone their tone across musical genres. The limited-edition Alternate Reality Collection (A$949 – $1899) will be available beginning March of 2019 and features Fender’s tradition of purposeful innovation. Offering eclectic models that mix and match multiple Fender design cues within a single instrument, the Alternate Reality Series instruments feature unique and unusual models that are “not just another Strat®”. These guitar and bass models are a brave new entry with one foot in the past and eyes to the future. • Powercaster™ (launching March 2019) features the giant sound of an Atomic™ humbucking pickup with the articulate voice of a single-coil soapbar pickup, giving this guitar’s tone a bit of an edge—perfect for slashing through a dense mix. A roasted maple neck and sweeping pickguard adds some visual flair to this unique instrument. • Sixty-Six™ (launching April 2019) has a unique visual style, which makes a bold statement with its down-sized Jazz Bass® body. The flexible HSS pickup configuration can crank out anything you ask, from fat leads to funky rhythm tones. Combining vintage-inspired appointments with modern, player-oriented features, it’s packed with a ton of useful, unique sounds. • The Meteora® HH (launching May 2019) sports a sleek body shape that carries on our tradition of arresting aesthetic design. The sound is as propulsive as its visually stimulating lines—it wants to roar on stage, thanks to the two fat-sounding Player Series humbucking pickups. With its retro-modern offset body shape, the Meteora HH has guts and grace. • Electric XII (launching July 2019) is designed for performance with dual split-coil pickups, a special 12-string hardtail bridge and a 3-position pickup selector, this jangly offset will definitely get attention onstage. • Tenor Tele® (launching August 2019) is a modern take on the 4-string tenor guitar, with a huge sound that belies its small size. Tuned to the same pitches as the top 4 strings of a 6-string or any of a number of popular alternate tunings, guitar players will feel right at home on this fun-to-play tiny Telecaster.